On the 25th of January each year, people all over Wales celebrate St Dwynwen’s Day, the Welsh patron saint of lovers. A Welsh love spoon is traditionally given as a Saint Dwynwen’s day gift. Dwynwen lived during the 5th century and fell in love with a prince called Maelon Dafodrill but, unfortunately her father had already arranged that she should marry someone else. Dwynwen was so upset she could not marry Maelon that she begged God to make her forget him. After falling asleep, Dwynwen was visited by an angel, who appeared carrying a sweet potion designed to erase all memory of Maelon and turn him into a block of ice. God then gave three wishes to Dwynwen. Her first wish was that Maelon be thawed; her second that God meet the hopes and dreams of true lovers; and third, that she should never marry. All three were fulfilled, and as a mark of her thanks, Dwynwen devoted herself to God’s service for the rest of her life. Traditionally a Welsh Love spoon is given as a Saint Dwynwen’s day gift but there’s plenty more to give in the Brecon Beacons. Read on to find all the gifts you can give this St Dwynwen’s Day! Buy the food lover in your life a gift from Black Mountains Smokery. Choose whole hams to tapas, cured or smoked meats such as Welsh Dragon sausage or welsh beef. Or give in and buy the lot! Place your order here. Plenty of gifts at Ty Cariad. Stockists for Emma Bridgewater pottery, Carrie Elspeth Jewellery, Powder scarves, Alex Clark Art, alongside homeware, gifts & wonderful Welsh products. A great independent shop in the charming town of Brecon, where you can pick up some delightful items and gifts! For those who like a tipple! If your other half likes nothing better than sipping away at a scotch or gin at the end of the day, forget the big names and watch them marvel at the taste of one of Penderyn award wining welsh whisky’s or gin’s. Or why not book a tour of the distillery, something to look forward to in the New Year find out more here. Take a pick from the many selections of hampers Authentically Welsh have put together containing all Welsh produce! Authenically Welsh provide a wonderful range of hand packed hampers bursting with flavoursome Welsh foods … delivered directly to your doorstep – perfect for a loved one Have a look at all the hampers and order yours online. Whether enjoyed in a 5-star hotel or a delightful Welsh Cafe, Afternoon Tea is one of the best ways to treat your loved one! The Brecon Beacons have some of the finest Afternoon Teas around, using local produce to create an afternoon tea worth having! 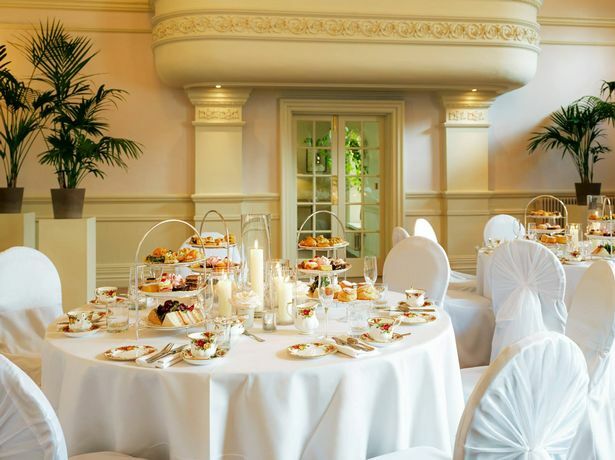 Click here for our top places to enjoy afternoon tea in the Brecon Beacons. If you’re stuck for ideas of a special gift to give this St Dwynwens and Valentines day, then head to The Old Railway Line Garden Centre where there are plenty of gifts to choose from! Why not visit the florist who can make you a bespoke bouquet from their extensive range of cut flowers for a romantic gift to a loved one. Who cares if it’s dark & cold outside? Burns Night was created to hold a candle in the midst of the dark for friends to get together to feast and celebrate. Combine that with the Saints day of the Welsh Patron Saint of Lovers, Santes Dwynwen, and we have a good reason to create a Burns night menus using local Welsh produce. Starting at 7.30 pm and sitting for 8 pm. Enjoy a welcoming drink on arrival, something to take the chill off. Tickets are priced at £30 a head. Sharing tables (unless specifically requested otherwise). Please contact the team to purchase your ticket on 01874 620 111 or contact us on enquiries@felinfachgriffin.co.uk for further details. What could be more romantic than gazing at the stars together? On a clear night in the Brecon Beacons, you can see the Milky Way, major constellations, bright nebulas and even meteor showers. It’s enough to make anyone starry eyed! Find out our top places here. If your other half loves nothing more than a cycle, then pop to Drovers Cycles in Hay On Wye for your one stop shop for clothing, gifts and bikes! allowing you a little well deserved ‘me’ time.Our spa also offers you the chance to relax in the Jacuzzi; detox in the sauna; take a dip in our seasonal heated pool or work-out in our gym, where qualified fitness instructors are on hand to help you. Or simply sit in our Moroccan styled relaxation room after a treatment, have a drink and just chill-out. However, it must be said that the views of Cribyn and Pen Y Fan from the house will almost help you to recharge as much as the treatments do, but one thing is for certain, with this combination we know you will leave us feeling relaxed, refreshed and simply – lovely! Don’t forget, there’s also plenty of accommodation where you can have a romantic getaway in the Brecon Beacons! From secluded Shepherds Huts to cosy B and B’s there really is somewhere for everyone to enjoy a memorable Valentines Day! Book your stay here! Thank you so much for including us in your newsletter! Our business page could do with being updated and so does our local producers profile. I think the blog post that you linked to is from 2015! I’m really happy to write the copy for all three and send it to you. We’ve also got some hampers that we are going to promote for St. Davids Day and Valentine’s Day if you’d like me to send you the information. Yes please send all that over, that would be great! We can do a blog on the hampers too.